In B2B terms, hemp biomass refers to the dried plant matter that is used for the production of refined hemp products, such as CBD oil, textiles, hemp plastics, and others. Raw hemp can be refined to make anything from wellness products to construction material. If you are a farmer growing hemp of looking for affordable hemp biomass for sale to get into the lucrative CBD business, get in touch with us. We will be happy to schedule an exclusive visit to our 300-acre facilities in Colorado Springs. Even though it is common industry practice to refer to the whole dry plant matter as “hemp biomass” (including flowers), this is not exactly the case. According to experts, the correct definition includes the stalks, leaves and flowers, only after they have been extracted. In general, we can distinguish three primary parts of the plant: hemp flowers, hemp seed and stalks. Highest CBD concentration can be found on the flower, but can be extracted from the biomass as well. High CBD hemp biomass can be used for the manufacture of CBD distillate and CBD isolate, as well as hemp oil used for food products. It is important to have a strategy regarding on your business goals before obtaining the suitable type of hemp biomass. High-CBD hemp biomass is more expensive than fibre biomass used for textile and pellet manufacture. At IHF, we have all types of premium hemp biomass available for sale. Please contact us now if you are interested to sell or buy biomass. Hemp biomass for extraction purposes is priced according to the plant’s content in CBD. 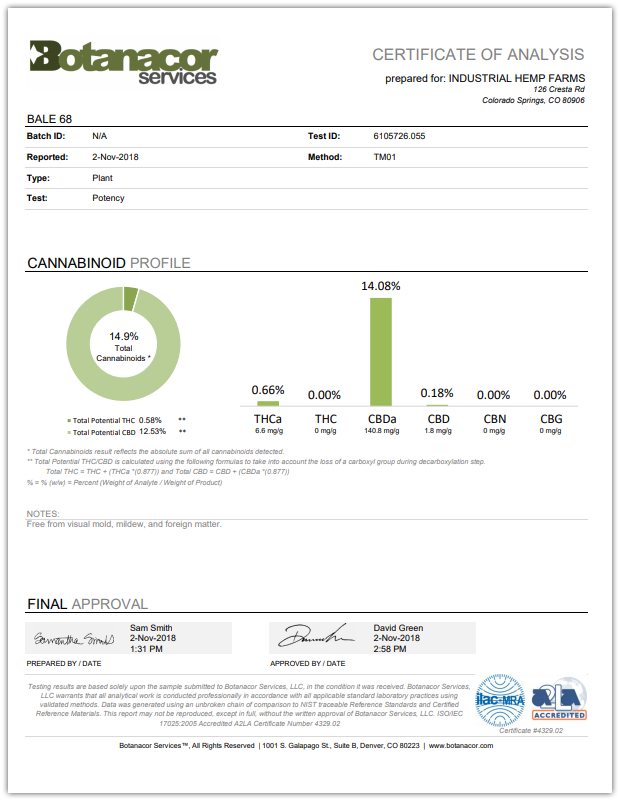 Our hemp biomass comes with verified certificates of analysis by Botanacor Services Labs in Denver, CO. This way, you always know what you pay for. Whatever the volume of your order, reach out to us for a custom quote. We’ll be happy to assist you. We cultivate and process high quality organic hemp in our state-of-the-art facilities in Colorado Springs. You are welcome to visit us for an exclusive tour and a one-on-one consultation. Got hemp biomass for sale? Work with us! IHF LLC also buys hemp biomass direct from farmers. We instantly secure a deposit on all crop we wish to buy. 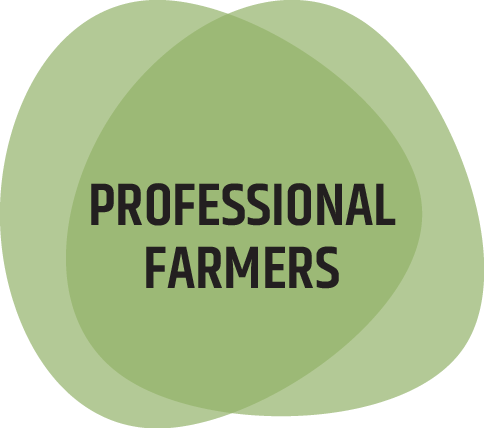 Farmers love to work with us due to quick negotiating, fast payouts and seamless transactions. We make the selling process easy, quick and painless for farmers, so they can go back to what their craft and do what they love to do most. Please reach out to us if you wish to sell your crop – we will buy it all and with the most guaranteed quick turnaround time. Another option we offer farmers is hemp field profit sharing and hemp futures contracts. We also offer CBD extraction services at affordable rates. We offer hemp futures contracts with cultivators from all over Colorado. Although CBD-rich hemp biomass is currently in high demand, many small farmers appreciate the security that a contract offers. If you are a farmer looking for an opportunity to secure your crop in favorable terms, call us at 800-985-9587 to learn more. We test our hemp biomass to ensure our clients get the best product at the best pricing. 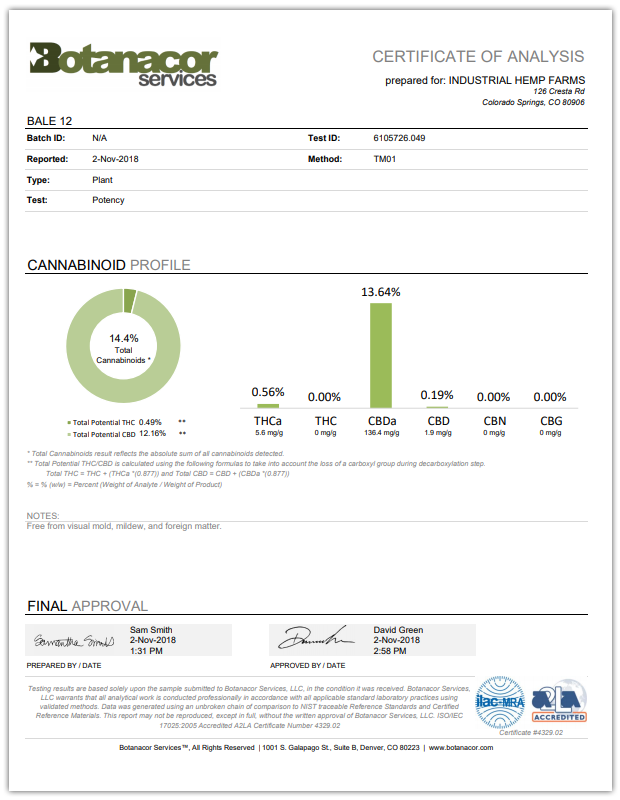 You can read the third-party reports about our hemp biomass CBD content below! CBD-rich hemp biomass is extensively cultivated in Colorado and is fully legal to purchase, process and resell under the 2018 Farm Bill. Why buy hemp biomass from Industrial Hemp Farms? 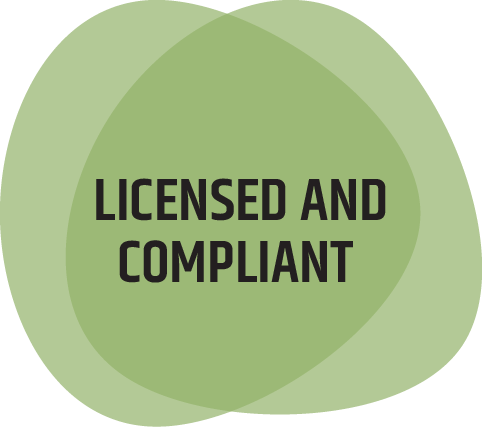 Industrial Hemp Farms offers compliant and tested hemp biomass for sale in Colorado. We have the capacity and the experience to handle all types of orders regardless of volume. We also pride ourselves in offering the most favorable terms to hemp growers, eliminating the middlemen. Get in touch with us to learn more about our service and book a visit to our facilities at Colorado Springs.